In late 2014, Berlin-based collective ‘The Gathering’ emerged on the scene with a series of large scale, multidisciplinary off-location events, taking over a former brewery, a warehouse complex, a former coin press and a railway repair station in the heart of the German capital. After a series of successful events, it was a natural progression for the collective to launch their own vinyl label. Two of the residents, Fabe & Tolga Top, both hailing from Mannheim in Germany, have collaborated to present the label’s first EP. 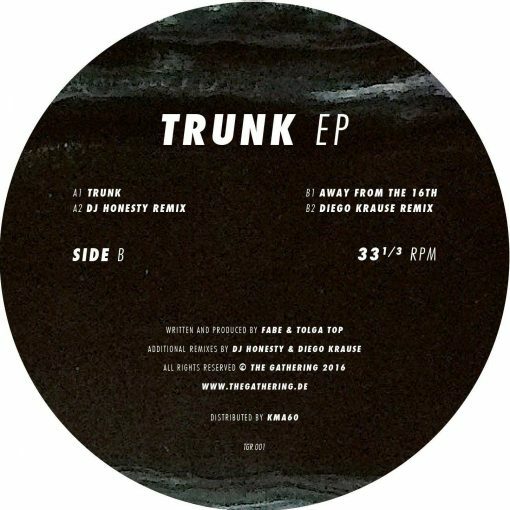 The release features two originals by the pair, alongside remixes from DJ Honesty and Diego Krause. More items from " The Gathering Recordings "
More items from " Fabe | Tolga Top "